U.S. home sales tumbled to their lowest level in three years in December and house price increases slowed sharply, suggesting a further loss of momentum in the housing market. According to the National Association of Realtors, existing homes sales declined 6.4% to a seasonally adjusted annual rate of 4.99 million units last month. In the latest outlook report, the International Monetary Fund (IMF) pared back its world growth outlook for 2019 from 3.7% to 3.5%, noting the threat of a widening trade war, Brexit and a slowdown in China. The strong start to earnings season is bolstering investor confidence even in the face of a slowdown in China’s productivity and growing concern over the partial government shutdown. Bond yields were slightly higher along most of the curve as a result. The 10-year UST was 3 basis points higher to yield 2.74%, while the 30-year UST was 1 basis points lower at 3.06%. The 10-year MMD finished 1 basis point higher for the week at 2.21%, and the 30-year MMD was 5 basis points higher at 3.08%. Source: Thomson Reuters, Bloomberg. 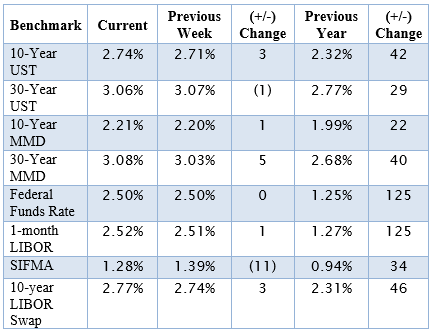 The table above reflects market conditions as of January 22, 2019.